FYI: With old world skills and modern sensibilitites, all objekts are conceived and brought to fruition, signed and guaranteed by myself, Heinz Brummel. Chains and bracelets are finished with hand made Clasps and Fasteners. Omega clips 18k gold posts & french hooks offer further insurance and quality to each earring set. Mutifunctional denotes an objekt that may be worn as a pendant, brooch and/or displayed as a sculpture with dock. Dock is the "cradle" environment that harbors, protects and elevates the brooch or pendant into the 3-d space of small sculpture, saving them from the darkness and ignominy of an invisible box in the dresser drawer. Fibula is an ancient type of fastener, consisting usually of a straight pin that is coiled to form a spring and extended back to connect with a catch. Enameling is technique of decorating metals with a pigment of vitreous nature, composed of powdered potash, silica and coloured with metallic oxides. Cloisonne is just one of many techniques in which a design is outlined on a metal plate with bent wire or metal strips that create walls or cells within which the enamel is wet packed and then fired at 1450º to 1550º degrees Fahrenhe, hence fusing it to the wires and metal surface. Carving is another method in which a design is cut into aluminum oxide resistant stencils, and then sandblasted, to create positive and negative patterns, which may be left as is or be filled in with new colour and then fired again. Stenciling involves using a cut pattern (stencil) through which the dry, powdered enamel is dusted onto the surface and then fired. x Metals: sterling and fine silver (sometimes oxidized black), 18k and 22k gold, 24k gold leaf, copper, brass (merlin’s gold), stainless steel. 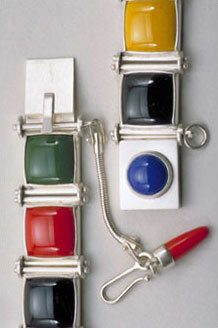 x Stone: carnelian, jade, black onyx, lapis lazuli, jasper etc. x Other: organic and synthetic materials ..ie bone, wood, plastics, essentially anything that works. Care and Maintainance: No traditional jewelry or industrial cleaners! Rather, pumice powder loaded onto an old tooth brush that has been moistened with dish soap, asticate and water rinse. That will do the trick. Please Contact me if you have any questions in this regard. To retard the inevitable tarnishing (which I personally embrace and accept for the shadow and contrast, objects may be stored in sealed plastic bags.